I started “The Iconic Carol Channing” blog with an overview. Now let’s start at the beginning. From the moment I entered the gate for our American Airlines flight to New York, I knew that Carol’s iconic fame had not faded. It had been 60 years since she conquered Broadway as the gold-digging Lorelei in Gentlemen Prefer Blondes (Remember “Diamonds Are A Girl’s Best Friend”?) and almost 50 years since she wowed theatre goers as Dolli Levi in the original 1964 Broadway production of Hello Dolly! That show won nine Tony Awards and Carol’s Hello Dolly! cast recording was inducted into the Grammy Hall of Fame in 2002. 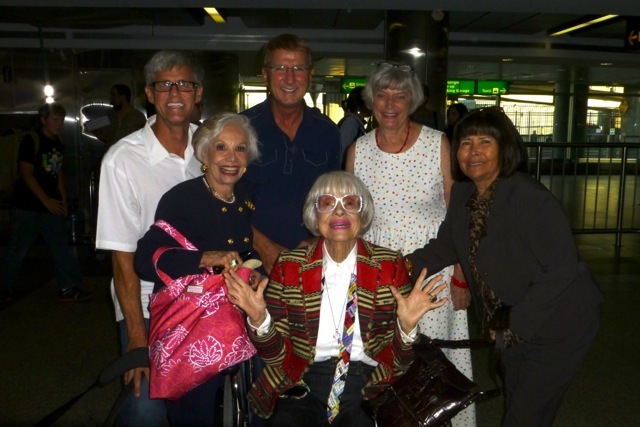 “Carol Channing is on the plane,” a stranger on the same flight told me as I picked up my boarding pass. The captain greeted us before we took our seats and said, “Be sure and say hello to Carol.” And so every passenger greeted the star in the first row of the first class cabin. She smiled and waved to each person as the parade of passengers passed by. “Doesn’t she look well?”…..”I remember the first time I saw her on stage”…..”I will never forget her in ‘Hello Dolly!’……”Wasn’t she terrific in the film ‘Thoroughly Modern Millie’”? I smiled at all the attention that the 92 year old Channing was receiving.